Even though the notion of discovering prostate cancer early may seem intriguing from a patient perspective, the topic has been dividing the medical community for decades. The sticking point is a simple question – how early is too early? While many a patient would welcome knowing about the disease before they notice any symptoms, some physicians believe such information could lead to unnecessary treatment. They do so because in many cases, prostate cancer doesn’t actually harm the patient. In the US, for example, men have a 16 per cent lifetime chance of receiving a diagnosis of prostate cancer, but only a 3 per cent chance of dying from it. That’s because the majority of prostate cancers grow too slowly to affect them at all. Put differently, men are more likely to die with prostate cancer than of it. With that in mind, it’s understandable that the notion of pre-symptomatic screening doesn’t always sit well with doctors trying to shield the patient from unnecessary intervention. By scanning a broad cross-section of the population for a disease before there is any specific impetus to do so, they expect the focus to shift to the many harmless cases that normally go unnoticed. Why is that even a problem? Because screening is just the first step on a long and complex diagnostic journey. Once the first alarm has gone off, doctors need to confirm a diagnosis by commissioning additional testing. In the prostate cancer space, that will ultimately involve a tissue biopsy – a procedure where small tissue samples are removed from a man’s prostate gland. Some of the many side effects – apart from intense emotional stress – include incontinence and erectile dysfunction. That’s not to mention the fact that more than half of all biopsies come back negative – meaning they were unnecessary in the first place – and that a high percentage is false negative, meaning they lead to treatment where no intervention is due. In the medical space, these phenomena are known as over-diagnosis and over-treatment – and have caused many a physician to approach early detection assays with extreme caution. But, where does all of that leave the patient? Is there really no way to screen men for early signs of prostate cancer and provide them with access to treatment without putting them in harm’s way? At first glance, the diagnostic toolkit available to physicians has remained widely unchanged for the past 20 years or so. Despite ongoing research, they still lack a diagnostic tool to accurately predict which men have a form of cancer that could be lethal and which may not be affected by it at all. Even our best bet, the US FDA-approved Prostate-Specific Antigen (PSA) test, is unable to distinguish between the kind of prostate cancer that will kill you and the one that won’t – prompting the man who invented it, Richard J Ablin, to call it “hardly more effective than a coin toss” in a New York Times op-ed from 2010. The problem, according to Ablin and the USPCTF, is that PSA testing – which will result in an antigen value between 0 and 100 – is only accurate in a select few scenarios: If it’s zero, you don’t have cancer. If it’s 100, you do. The murky middle ground, however, leaves ample room for interpretation – and with it, room for misjudgement. Does that mean there still no way to detect prostate cancer without risking patient health in 2018? Not according to experts like Li-Ming Su, who is advocating a combination of PSA and additional tools in a move to enable what he called “relaxed screening” and overcome the test’s inherent inaccuracy – including prostate examinations and a move to active surveillance for low risk cases. A second, highly promising ‘PSA boost’ has recently been teased by Mahidol University’s Dr Sebastian Bhakdi (note Dr Bhakdi is also serving as CEO of X-ZELL Inc). 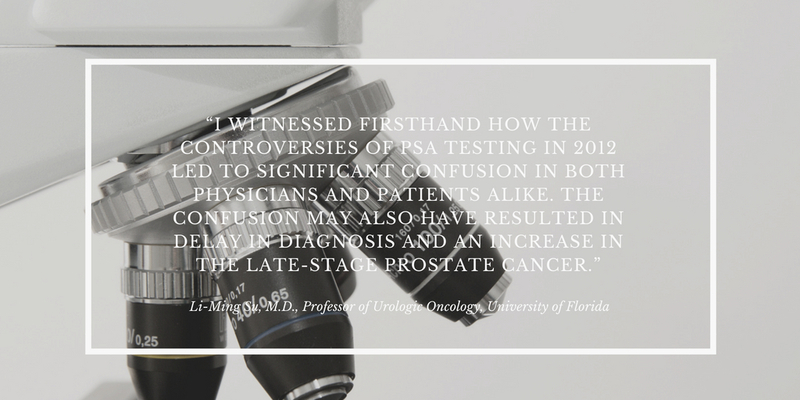 According to the cancer detection specialist, a new study is currently being finalised that will outline a new way for urologists to handle patients with a diagnostically ambivalent PSA score more confidently. To reduce that high percentage of unnecessary interventions, Dr Bhakdi and his team at Mahidol University have developed a new blood test to “substantially enhance” the predictive value of the PSA assay. In combination with additional diagnostic tools such as X-ZELL’s new liquid biopsy, PSA testing may therefore be on track to experience a significant comeback in the decade to come – as the base value for a reliable early detection process and maybe even as a key ingredient for “relaxed screening”. In fact, even the USPSTF is now changing its opinion. In May 2018, the task force partly reverted the controversial 2012 decision to abandon PSA-based screening – recommending that all US men between the ages of 55 to 69 should now consider it again. * The USPSTF is a government task force comprised of members from the fields of primary care and preventive medicine that currently makes evidence-based recommendations about clinical preventive services.